Prostate cancer (PCa) is the most common malignancy worldwide. Until now, PSA screening is widely used in detecting PCa. However, PSA is an organ-specific marker rather than PCa-specific biomarker which makes PSA testing an excessive examination procedure and requires interventional therapy[2, 3]. Therefore, sensitive and specific biomarkers for PCa diagnosis and prognosis are urgently needed. EphrinA2, located on chromosome 19p13.3, is a ligand to several Eph receptors including EphA3, EphA4, EphA5, and EphA8. EphrinA2, is a membrane-bound protein with a glycosyl-phosphatidylinositol (GPI) lipid anchor. It has been implicated in various physiological processes such as tissue and organ development, neovascularization, cell adhesion and separation, and also in the progression of many disease including oncogenesis. For example, Fox et al. 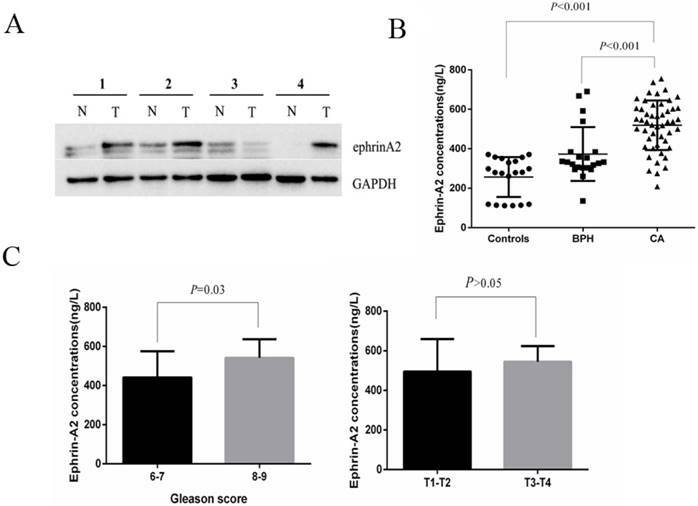 demonstrated by identification of Eph/ephrin profiles that ephrinA2 is involved in tumor invasiveness and tumorigenesis. Feng et al. systematically evaluated the role of ephrinA2 in hepatocellular carcinoma (HCC) and found that ephrinA2 is significantly up-regulated both in cell lines and clinical tissue samples of HCC, which mainly contributed to apoptosis rather than proliferation in the progression of HCC. Several studies showed that ephrinA2 transcript is overexpressed in breast cancer and renal cell carcinoma, implying that ephrinA2 may be a potential biomarker for these cancer[6, 8]. Our previous studies also showed that the level of circulating ephrinA2 is significantly higher in patients with prostate cancer than those with benign prostatic hyperplasia (BPH) or health controls. Furthermore, a recent study reported that exosomal ephrinA2 derived from serum was up-regulated in patients with osteoporosis, a common complication of PCa patients undergoing androgen deprivation therapy. The data above suggests that ephrinA2 may be a potential biomarker for the diagnosis or prognosis of many diseases. Yet, the expression of exosomal ephrinA2 in PCa remains elusive. In this study, we initially explored the ephrinA2 expression in whole serum and tissues. Subsequently, we analyzed for the circulating exosomal ephrinA2 in clinical samples and evaluated the correlation between exosomal ephrinA2 and tumor-node-metastasis (TNM) staging and Gleason score. Finally, we investigated the diagnostic efficiency of exosomal ephrinA2 for BPH and PCa patients. Serum samples were collected from 20 healthy persons (controls), 21 BPH patients, and 50 PCa patients (Table 1). Blood samples were centrifuged at 3000g for 5 min to extract serum which was stored at -80°C until analyzed. Each sample was divided into two parts, one for ELISA test, and another for exosome isolation. All tissue specimens were obtained from patients undergoing prostate needle biopsies (PNB) or radical prostatectomy (RPE). A written consent was obtained from each patient. Exosomes were isolated with a minor modified protocol according to Thery et al. Briefly, thawed, serum samples (400μl) diluted in PBS were centrifuged for 30 min at 2000 × g and for 45 min at 12000 × g. Afterwards, the samples were filtered through a 0.22-μm pore filter (Millipore, Bedford, USA), followed by ultracentrifugation (Beckman Coulter, Inc. CA, USA) at 150000g for 2 h. Thereafter, the supernatant was collected and designated as exosome-depleted supernatant (Sn), and the pellets were washed followed by a second step of ultracentrifugation at 150,000 × g for 2 h and re-suspended in 80μl lysis buffer. The amount of pellet protein was measured by the BCA protein assay kit (Beyotime, Nantong, China). These pellets were divided into aliquots and kept at -80°C until further analysis. A drop of exosome pellets (approximately 20μl) was placed on the formvar carbon-coated nickel grid for 5 min. Then, a drop of uranyl acetate was placed on the grid and incubated for 1 min in the dark. After standing for 30 min, the grids were examined with TEM (Hillsboro, FEI, USA). Western blotting procedures were performed following a standard protocol. The protein was solubilized with loading buffer (5×) and heated at 100°C for 10 min. Proteins were separated by SDS-PAGE using 10% gels and transferred to a polyvinylidene fluoride membrane (PVDF, Bio-Rad Laboratories Inc, California, USA). The membranes were incubated overnight at 4°C with primary antibodies: rabbit anti-human CD63 (1:500, SBI, USA), rabbit anti-human β-actin (1:5000, Proteintech, USA), mouse anti-human GAPDH (1:2000, Proteintech, USA), and rabbit anti-human ephrinA2 (1:200, DF3027, Affinity Biosciences, USA) followed by horseradish peroxidase-conjugated secondary anti-rabbit and anti-mouse (1:2000, CoWin Biosciences, China) for 2 h. The membranes were visualized with enhanced chemiluminescent substrate (Bio-Rad Laboratories Inc, California, USA). Both serum EphrinA2 and exosomal EphrinA2 were quantified using the ELISA kit (TSZ, NJ, USA) according to the manufacturer's instructions. Briefly, concentration gradient of calibrators, blank controls, and sample were placed into the microwells. Thereafter, the plates were incubated for 30 min at 37 °C and washed five times with washing buffer. Then, horseradish peroxidase (HRP)-conjugated anti-human ephrinA2 antibody was added and incubated for 30 min at 37°C. After washing, 50μl tetramethylbenzidine (TMB) substrate was added and incubated for 20 min at 37°C in the dark. Finally, a stop solution was added to each well, and incubated for 10 min. The absorbance of the resulting product was read at 450nm within 15 min via the microplate reader (Bio-Rad Laboratories Inc, California, USA). All samples were assessed in duplicate. All statistical analyses were performed using SPSS16.0 (SPSS, Chicago, USA). A two-sided P<0.05 was considered statistically significant. The one-way analysis of variance (ANOVA) was used to evaluate the statistical significance among patient groups. Receiver operating characteristic (ROC) analysis was used to verify whether exosomal ephrinA2 and serum PSA levels could be used to distinguish patients with PCa from BPH patients. Expression of ephrinA2 in tissues and serum. A. Expression of ephrin A2 protein in 9 pairs of PCa tissues by western blotting (N, adjacent tissue; T, tumor tissue). The result shows the representative western blots in four pairs. B. Expression of ephrinA2 protein in 20 healthy controls, 21 BPH patients and 50 PCa patients measured via ELISA. C. The correlation between exosomal ephrinA2 and TNM staging or Gleason score respectively. To investigate the expression profile of ephrinA2 in clinical samples, we first analyzed ephrinA2 protein expression in tissues via western blotting in 9 paired prostate carcinomas and noncancerous tissues. The result showed that the expression of ephrinA2 protein was relatively higher in PCa tissues (Figure 1A). We thereafter detected whole serum ephrinA2 concentrations by ELISA in 20 heath controls, 21 BPH, and 50 PCa patients (Table 1). Consistent with our previous studies , serum ephrinA2 concentrations were significantly higher in PCa patients, compared to BPH patients and controls (Figure 1B, P<0.001). Furthermore, ephrinA2 was positively correlated with Gleason score (P=0.03) (Figure 1C). However, there was no correlation between whole serum ephrinA2 and patient's age, PSA levels and TNM (Figure 1C). Exosomes isolated from serum were observed by TEM. As shown in Figure 2A, exosomal ephrinA2 had a rounded morphology with a size of approximately 100nm. The expression of CD63, a marker for exosomes, confirmed the presence of exosomes (Figure 2B). To verify whether the circulating exosomes contained ephrinA2, Sn and exosomes were evaluated by western blotting. β-actin was used to maintain western blotting loading. As expected, the result showed that ephrinA2 was detected both in exosomal fractions and Sn (Figure 3). The exosomal ephrinA2 had a small part of the whole which was consistent with ELISA results. To explore the prevalence of exosomal ephrinA2 in PCa, we analyzed its expression by ELISA in 20 healthy controls, 21 BPH, and 50 PCa patients (Table 1). 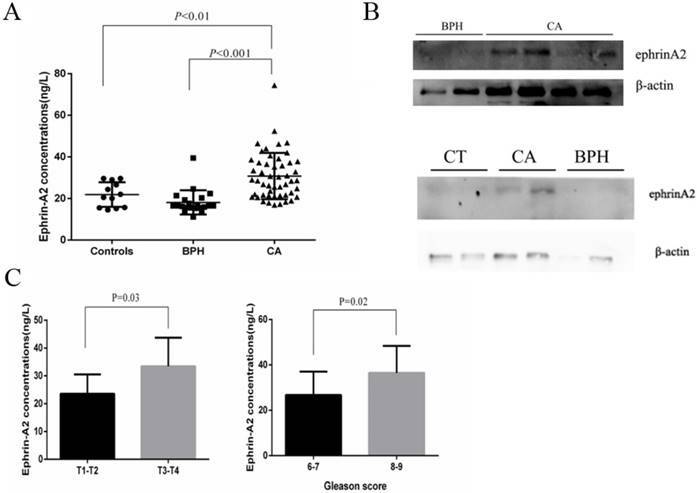 Compared to controls and BPH, the concentrations of ephrinA2 were significantly higher in PCa patients (Figure 4A), which was in agreement with the western blotting results (Figure 4B). Furthermore, ephrinA2 expression was positively correlated with Gleason score (P=0.02) and TNM (P=0.03) (Figure 4C). But, there was no correlation between exosomal ephrinA2 and patient's age, and PSA levels (Table 1). Correlations between exosomal ephrinA2 levels and clinicpathological parameters. To distinguish PCa from BPH patients, ROC curve was performed based on the ephrinA2 levels and PSA. The whole serum ephrinA2 levels were superior in differentiating PCa patients from those with BPH (area under curve(AUC)=0.7666; confidence interval(CI) = 0.6284-0.9047; P=0.0004), to whole serum PSA levels (AUC=0.6043; CI=0.4586-0.7499; P=0.1678) (Figure 5A). The optimal cut-off point of ephrinA2 concentration was 392.5ng/L, with a sensitivity of 80.39% and a specificity of 80.59 %, whereas the whole serum PSA cutoff value was 38.43, with a sensitivity of 42.86% and a specificity of 82% (Figure 5C). The exosomal ephrinA2 levels were superior in differentiating PCa patients from those BPH (AUC=0.9062; CI=0.8191-0.9933; P<0.0001), than PSA levels (Figure 5B). The optimal cut-off points of exosomal ephrinA2 concentration was 20.4ng/L, with a sensitivity of 88% and a specificity of 80.95%. In this study, we demonstrated that the level of ephrinA2 was up-regulated both in serum and in tissues from PCa patients. Similarly, exosomal ephrinA2 was significantly higher in PCa patients and it was positively correlated with Gleason score and TNM staging. Furthermore, based on the ROC curve of two different forms of ephrinA2, we found that exosomal ephrinA2 was superior to the whole serum ephrinA2 and PSA in distinguishing PCa patients from those with BPH which suggested that exosomal ephrinA2 may be a better biomarker for the diagnosis and prognosis of PCa. Confirmation of the ultracentrifugation pellets containing exosomes. A. TEM micrographs of exosome isolation by ultracentrifugation. Bar represents 100nm. B. Western blotting for exosomes using exosomal marker CD63. Expression of ephrinA2 in exosomes and exosome-depleted supernatant respectively. E, exosomes. Sn, exosome-depleted supernatant. Exosomal ephrinA2 expression in clinical samples. A. Expression of ephrinA2 protein in 20 healthy controls, 21 BPH patients and 50 PCa patients was measured via ELISA. B. The correlation between exosomal ephrinA2 and TNM staging or Gleason score respectively. C. Expression of exosomal ephrinA2 in patients evaluated by western blotting. ROC curve for ephrinA2 and serum PSA. A. ROC curve analysis of serum ephrinA2 expression in BPH patients versus PCa patients with a specificity of 80.39%, and a sensitivity of 80.59%. B. ROC curve analysis of exosomal ephrinA2 expression in BPH patients versus PCa patients with a specificity of 88% and a sensitivity of 80.59%. C. ROC curve analysis of serum PSA expression in BPH patients versus PCa patients with a specificity of 42.8%, and a sensitivity of 82%. Typically, exosomes are secreted by all cells with a diameter of 30-120nm lipid bilayer membrane and they can be identified in biological fluids including urine, blood, serum and saliva[13-17]. Exosomes are small extracellular vesicles with various molecular constituents including proteins, mRNA and microRNA which have the potential to be biomarkers in various malignancies including PCa. Increasing evidence has demonstrated that most of Eph receptors and ephrin ligands can be detected in exosomes. For example, proteomic profiling has identified 11 Eph receptors and 2 ligands (ephrinB1, ephrinB2) in colon cancer cell-derived exosomes. In addition, Gong revealed that EphB2 anchored on the exosomes can induce ephrinB1 reverse signaling and bring about neuronal axon repulsion. Furthermore, a study reported that ephrinA2 was identified in exosomes which were derived from serum of osteoporosis patients, a complication of PCa patients undergoing androgen deprivation therapy, which implied that exosomal ephrinA2 may play an important role in PCa disease progression. In the present study, we not only found the presence of ephrinA2 in exosomes purified from serum of PCa patients, but also observed that the level of serum exosomal ephrinA2 was significantly higher in PCa patients than in BPH patients and controls. Moreover, a significant association between exosomal ephrinA2 and clinicopathologic TNM staging and Gleason score was observed in this cohort study. These results implied that exosomal ephrinA2 may be a useful serum marker for the diagnosis and prognosis of PCa. We further analyzed the ephrinA2 expression in 9 paired prostate carcinomas and noncancerous tissues. In line with the elevated serum exosomal ephrinA2 in PCa patients, the expression of ephrinA2 protein was relatively higher in PCa tissues than noncancerous tissues which is consistent with previous studies. Moreover, the number of exosomes in serum derived from PCa patients was more than that of noncancerous patients. The above data suggests that prostatic tumor cells may produce more exosomes expressing ephrinA2. Interestingly, other soluble isoforms of ephrinA2 have also been identified in serum from PCa patients. Being a membrane-bound protein with a GPI lipid anchor, how is ephrinA2 released into the blood? Hattori et al. confirmed that the membrane-bound ephrinA2 may be a substrate of ADAM10, a transmembrane metalloprotease shedding a range of cell surface proteins including ephrinA ligands, which releases soluble fragments into the cell medium. Since the activity of ADAM10 is elevated in PCa tissues, a possible reason for the elevated serum ephrinA2 concentration is the cleavage of ephrinA2 at the prostate tumor tissue by ADAM10 into soluble ephrinA2 fragments which are released into the blood in PCa patients. However, further research is required to fully uncover the underlying mechanism of the elevated serum ephrinA2 concentration in PCa remains. PSA is a widely recognized and most important tumor marker for PCa, which is applied in pathological diagnosis and observation of curative effects. Yet, in BPH, urinary retention or inflammatory diseases, PSA level may exceed normal ranges. Therefore, a more sensitive and specific biomarker that distinguishes PCa from BPH is needed. In this research, we sought an alternative strategy to detect the presence of PCa via measuring serum exosomal ephrinA2 concentration and serum ephrinA2 levels in addition to serum PSA concentration. From the ROC curve, we found that the AUC of exosomal ephrinA2 was 0.9062 (CI=0.8191-0.9933), while that of serum ephrinA2 was 0.7666 (CI=0.6284-0.9047) and that of serum PSA concentration was 0.6043 (CI=0.4586-0.7499). These observations imply that exosomal ephrinA2 level had a superior diagnostic value for clinical application compared to serum ephrinA2 or PSA concentrations. Yet, we acknowledge that more follow-up studies are required to validate this hypothesis and to support the use of exosomal ephrinA2 as a biomarker for PCa into clinical practice in future. In summary, we not only found the presence of circulating ephrinA2 in the serum of PCa patients, but also show that exosomal ephrinA2 is an important component of the circulating ephrinA2. Although exosomal ephrinA2 concentrations are far less than the Sn, the diagnostic efficiency of exosomal ephrinA2 was superior to the whole serum ephrinA2 in distinguishing PCa patients from BPH patients. These results illustrated that exosomal ephrinA2 is a potential biomarker for PCa and can be used to monitor the molecular progress for supervision the progression of PCa. We are grateful to Jiangsu Key Laboratory of Anesthesia and Analgesia Application Technology for the technical assistance. This study was supported by the Grant from the Department of Science & Technology, Xuzhou, Jiangsu, China (No. KC16SL108), the Jiangsu Provincial Medical Youth Talent (No. QNRC2016781), the Natural Science Foundation of Jiangsu Province (No. BK20160233, No. BK20140228). The samples from human in this study were obtained in accordance with the ethical standards of the ethics committee of the affiliated Hospital of Xuzhou Medical University and the Institutional Review Board and the 1964 Helsinki Declaration and its later amendments.